I’m doing Book Riot’s Read Harder Challenge 2017 for the first time this year, with some of the (always-inspiring) London Book Clubbers. We have 24 tasks to complete, so it equates to two per month (although one book can cover more than one task). Like DiverseAThon, it’s great way to expand my reading. Fantasy and comics will be new to me, and Roxanne Gay has set a task to read a book published by a micropress, which will be fun to seek out. I really enjoyed The Dry, a thriller set in rural Australia. A smart protagonist and some realistic local characters, with a strong, well-paced story. Harper does a wonderful job of creating the atmosphere of a small country town, both the landscape and a community on edge. Recommended. Read a book by an immigrant or with a central immigration narrative: both The Good Immigrant and Behold the Dreamers by Imbolo Mbue qualify – I reviewed The Good Immigrant (excellent selection of essays) in an earlier DiversAThon post. Behold the Dreamers is a warm, engaging story about Cameroon immigrants to New York. The characters are sympathetic and Mbue does not shy away from the difficulties they face, the stress of job insecurity and the strain this puts on a marriage. For me, it lacked dramatic tension, as we know what happened to Lehman Brothers, and it was a little too earnest, but I liked having Jende and Neni’s perspectives. Thought-provoking and good, honest writing. Read a book published between 1900 and 1950: Fantastic Night by Stefan Zweig. A wonderful collection of Stefan Zweig’s stories. His writing is elegant, philosophical and humane. Zweig was extremely erudite but wore his knowledge lightly. He conjures up beautiful turn-of-the-century European settings and a time when people travelled, for leisure and then necessity. The bittersweetness of past loves, the fears of war and a reverence for forgotten greats (a bibliophile, an actor) drive these tales, told with warmth and style. Read a YA or middle-grade novel by an author who identifies as LGBTQ+. I have to thank Jamie Klingler of the London Book Club for this one: the audiobook of Aristotle and Dante Discover the Secrets of the Universe, read by Lin Manual Miranda. An excellent book – poignant, true and funny. I laughed, I cried and absolutely loved Miranda as a narrator. A winner! Sublime but elusive, the story of the doomed love between two women, told in vivid prose. Paris is seedy, the characters flawed and Gothic. Barnes’ writing gleams: her poetic wordplay and wit reminded me of Shakespeare; the confessional tone pre-dates Camus’ The Fall, and the Woolf comparisons are apt too. Strong, dense, it refuses to be matter-of-fact, but feels searingly honest. Read a book where all point of view characters are people of colour. I have something quite different for this one. 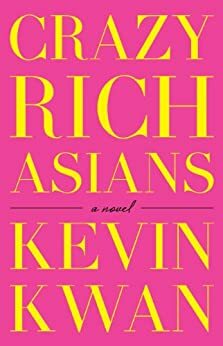 Our Adelaide Book Club is going to Hong Kong in June, so in preparation this month we have read Crazy Rich Asians (about to be made into a movie). This has been called Dynasty on steroids and the next 50 Shades of Grey. If you’re a fan, you’ll love it. Some of the praise is overblown (it’s no Pride and Prejudice or Evelyn Waugh), but Kwan meticulously describes the lives of the super-rich in Asia, and the materialism and prejudices of those places, with accuracy and humour. One-dimensional characters, every luxury brand name-checked. A bit superficial for me, but very good for what it is.